View from Tilbury Knob looking down the Susquehanna River. 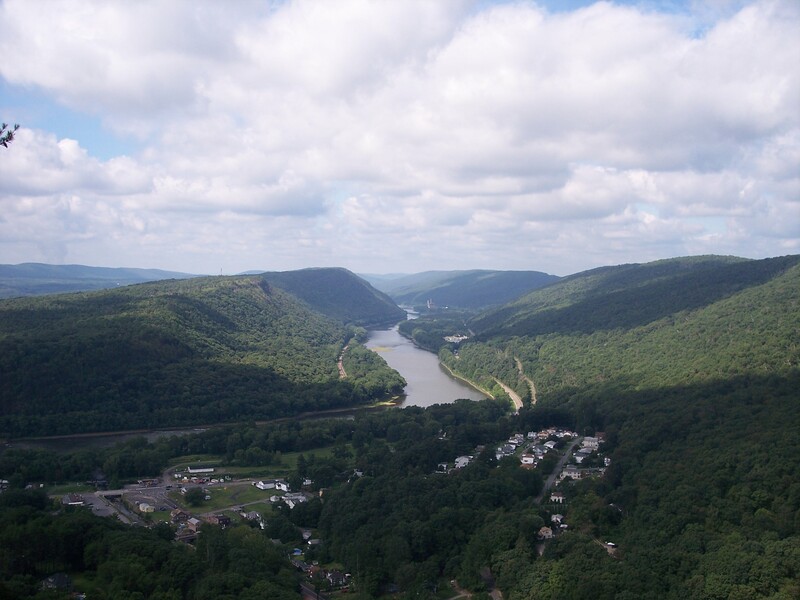 Located across the Susquehanna River from Nanticoke is one of the Wyoming Valley’s most impressive natural features- Tilbury Knob. Here, striking red, corrugated cliffs rise hundreds of feet over the river, offering superb views. The knob is also popular with rock climbers, who come to scale its numerous cliffs and ledges that rise through the trees. I finally was able to visit the knob, which is now a part of the Harvey’s Creek Tract of the Lackawanna State Forest. No formal trails lead to the cliffs, so, as usual, we were relegated to a bushwhack. First, we began to explore the base of the cliffs, comprised of a white or gray sandstone. There was an impressive overhang which harbored a nest, possibly belonging to a hawk. 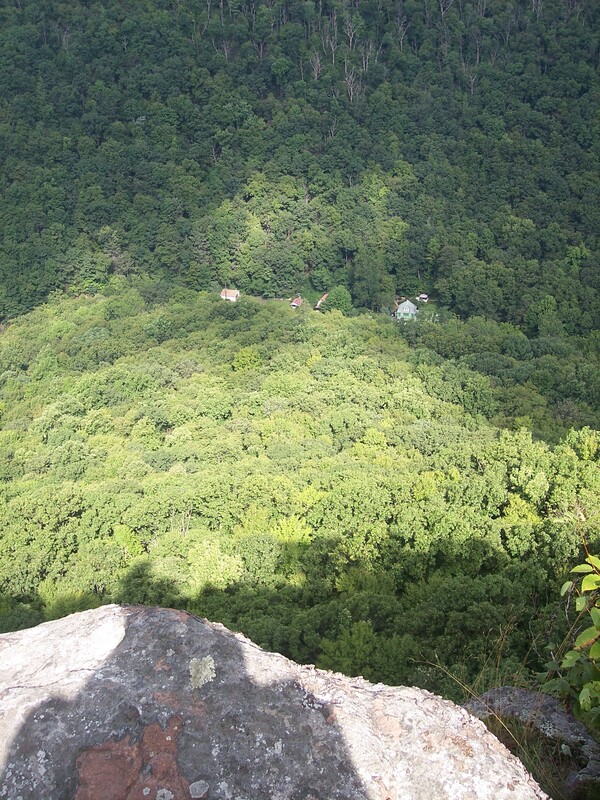 We hiked to the top of these cliffs, battling laurel, pitch pine, and scub oak. Old game trails meandered through the sparse woods, which concealed hidden ledges and cliffs that would drop off suddenly. We were surprised to see a view to the east, obscured with morning haze, from a sloping ledge. The hike continued as we tried to find the cliff. We passed a small meaodow with a view to the southwest and crossed a jeep road. Soon we were at the cliff, as the earth just fell away. But we were not alone, a few hundred feet from us along the escarpment was a peregrine falcon, voicing her displeasure with screeches and cries. The peregrine is the fastest animal in the world, capable of diving at over 200 mph. Peregrines nest along cliffs, and we made sure to avoid her. We hunkered down below some branches, and she stopped her screeches. We headed north along the escarpment, away from the falcon, to more impressive views looking up Harvey’s Creek Gorge. Shadows of passing clouds were cast across the green mountains, under a blue sky. We turned around, keeping away from the falcon, and reached another view, and proceeded south along the cliff line. There was a nerve-wrattling overhang that jutted out over the cliff. I walked out onto it. I felt like I was suspended in the air. 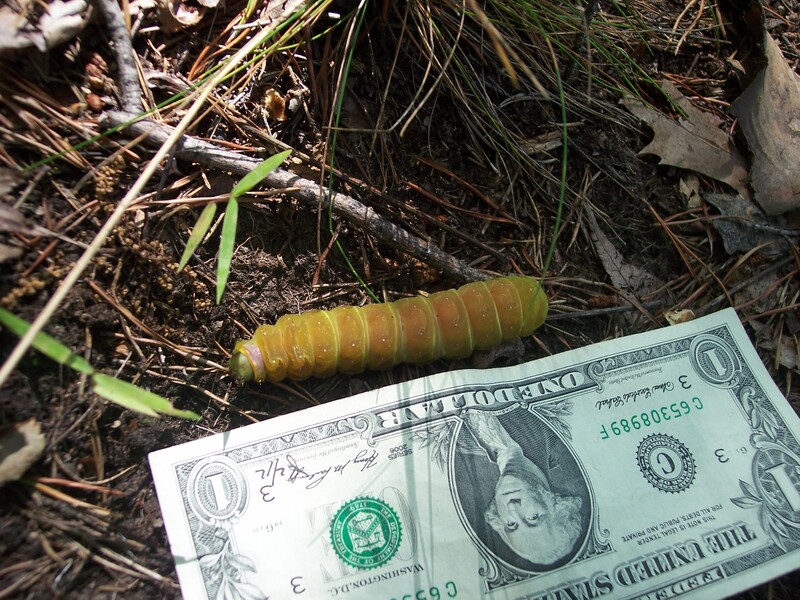 We continued our descent through pine forests when Ryan spied something I have never seen before- a huge, flourescent caterpillar. I have no idea what kind it was. We soon reached the base of the cliffs and returned to our cars, before heading down the road to the Little Shickshinny Creek Falls. 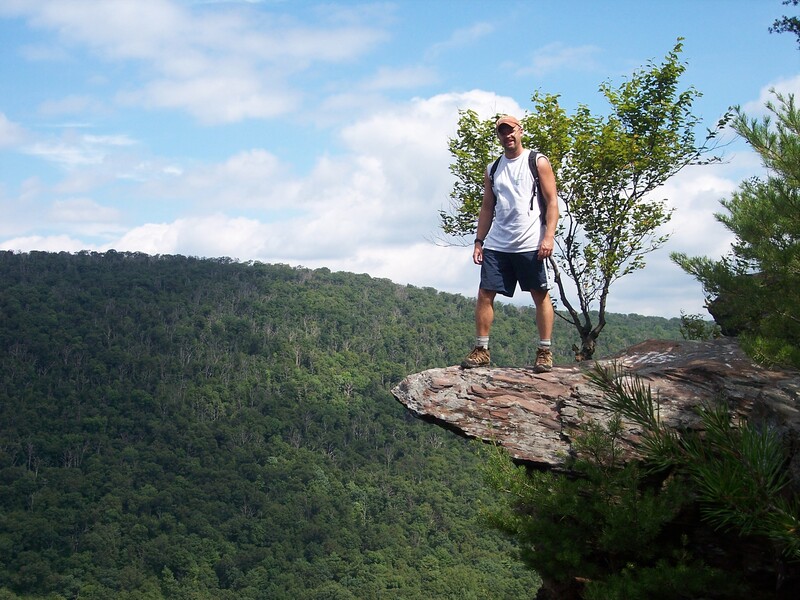 Tilbury Knob is an impressive place, offering towering cliffs, superb views, and great wildlife. It rises over Harvey’s Creek with its rapids and pools and commands a dominating presence over the creek’s gorge. I look forward to exploring more of this tract in the Lackawanna State Forest.